There are fancy cameras, and then there are flagship professional DSLRs—big super powerful overkill machines designed for ultra-fast performance. Nikon teased its latest monster, the D5, in the fall. Now, it’s been formally introduced. This overhaul is the first major refresh of Nikon’s top line since the company announced the D4S two years ago. The D4 came out back in 2012. The camera introduced some rudimentary Full HD video powers to Nikon’s flagship line as well as unprecedented high ISO image quality, which made the camera killer in low light. The D4S further refined the video. With the D5, the line gets 4K video capture. In four years Nikon’s top camera has gone from no video to 4k video. Nikon’s never been known for video, and its learning curve has always been ugly, so I wouldn’t necessarily expect a barnburner right away. Then again, much cheaper cameras like the Panasonic GH4 and the Samsung NX1 deliver excellent 4K video, so maybe we’ll be impressed. This is still probably primarily a still camera, and it spares no spec on this front. The camera is built for speed, with a new 153-point autofocus, and a maximum continues frame speed of 12 frames-per-second. It has a 20.3-megapixel full-frame sensor, which is higher-resolution than the previous D4’s. Like its predecessors, the D5 is a big boy. At a glance the ergonomics seem similar, but we’ll have to wait until we know just it handles. And yes, this will be so, so, so, so expensive: $6500 when it drops in March. I haven’t been able to cover everything so please refer to the release. 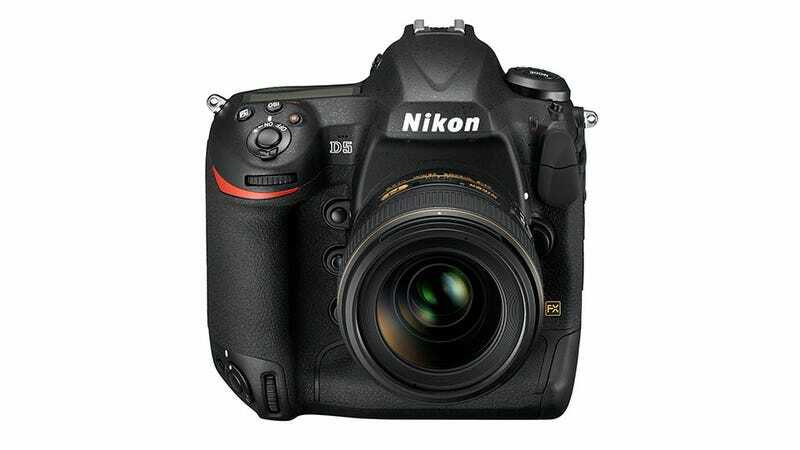 Nikon also introduced the D500, its new top-of-the-line DX format. (Read: APS-C-format-camera.) The idea here is to bring some of the top level features of the D5 down to a “more affordable” price point. For example, the D500 has the D5’s 153-point autofocus system and the same Expeed 5 image processor. It sports 20-megapixel sensor. It also has a 3.2-inch touchscreen and the other obvious specs you’d expect. And I put “more affordable” in quotes because this thing is expensive! The body alone is $2000 and is expected to drop in March. As with the D5, please see the D500 for details that I haven’t been able to cover in detail here.